I just downloaded and rebuilded our word addin using the latest available version for delphi vcl (adxvlc-v803-b1441-pre). As far is can tell it might have something todo with the TadxWordTaskPane as i can't get it to display anymore and it seems changing the settings you mentioned to me in an earlier topic i created about the taskpane becomming visible outside word window from "optimize for best view" to "optimize for compatibility" makes the message go away. I'm guessing this this means the new version does not fix that problem yet and is displaying a message instead at the moment. Will this get fixed eventually or do we have to change something in source code / dfm's to make it compatible again with "optimize for best view" setting which is the default in word with this new release? What you see is a reaction to the recent feature introduced in Office 2016: support of multiple monitors with different DPI settings. This feature isn't supported in Add-in Express version 8. 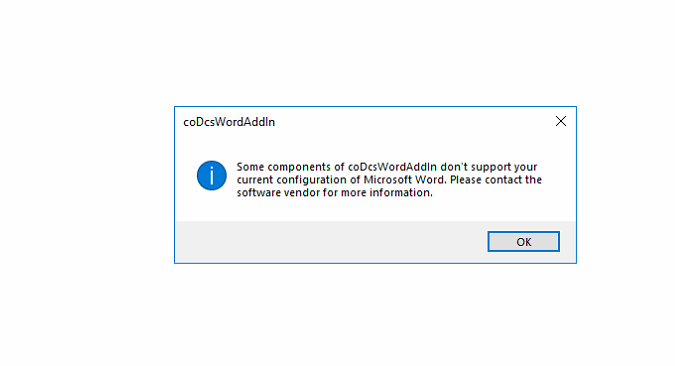 To avoid this, you can select the "Optimize for compatibility" option button on the General tab of the dialog window which you open via File | Options. We are going to publish a new Add-in Express version supporting multiple DPIs in June. I'll post a note here when it is published. You'll see my message here when the new build is published. I don't know if you are aware of any other issues related to this multi-monitor/dpi change? I do have a few users on the latest version of Word 2016 and Windows 10 who have a strange problem with a Word task pane. The pane when it's opened doesn't display properly and just shows as an empty white box with no border or contents. It started happening after they had an update on their system. It was working fine before the update. Does the issue go away if you select the the "Optimize for compatibility" option on the General tab of the dialog window which you open via File | Options? If so, the issue occurs because your Add-in Express version doesn't support multiple DPIs feature of Office. You're right it did fix the issue. So would the new version of ADX have some way of dealing with this? An option or function call? Have a look at Andrei Smolin Add-in Express version 9 adds support for multiple monitors in Office. Although that blog targets the .NET edition of Add-in Express, it gives an idea of what you'll have to do. Actually, that post doesn't disclose that supporting multiple DPIs may be really difficult if the controls used in your add-in wrongly assume (or implement) something and this makes them incompatible with multi-DPI support in Office. In .NET, we saw such controls among standard controls supplied with Visual Studio e.g. TabControl. Desktop applications that use older Windows programming technologies (raw Win32 programming, Windows Forms, Windows Presentation Framework (WPF), etc.) do not automatically handle DPI scaling and, as a result, will render blurry or be sized incorrectly in many common usage scenarios unless work is done by the developer to handle these scenarios. That is, it turns out that the technologies that you (and us) use to draw controls becomes declared old all of a sudden. It doesn't look like the future will be calm and easy. We are going to publish Add-in Express for Office and VCL, version 9 tomorrow or the day after tomorrow.